Enhancement Added Forza Horizon 4 car import. Enhancement F1-2018 Import has improved decal shader and all textures are now extracted for a model. Enhancement Drag-and-Drop of file types supported by Import Plugins. It should also be possible to use Open With… from the File Explorer context menu but this can have a problem resulting from file permissions. Download version 3.1s at the download page. 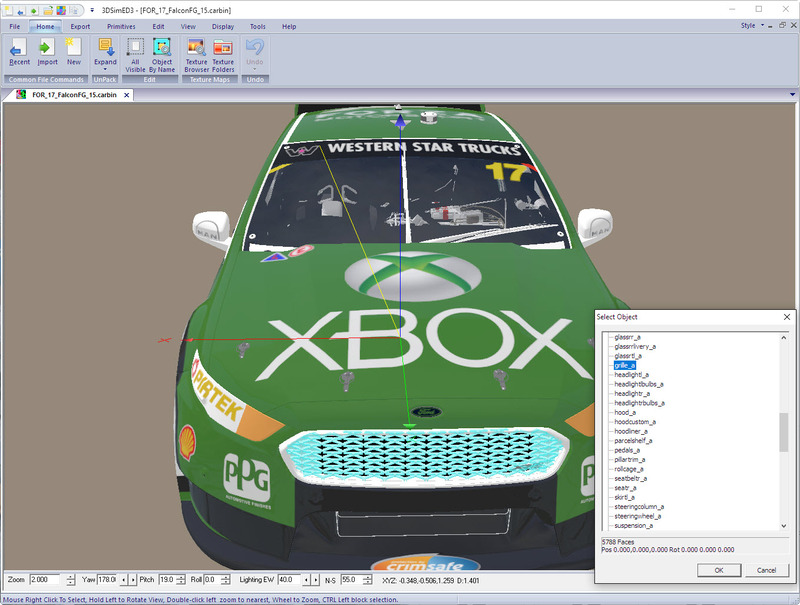 Enhancement: FBX Import prompts for how to name objects. Object naming from Mesh names is recommended but if this gives unsatisfactory results then use the option to name the Object using the Node names. Fix: rF2 .GMT with bone animation failing to import. Fix: Detecting a video card is capable of HDR Rendering could cause crashes. Download Version 3.1r .zip . Enhancement HDR Rendering now has a simple on/off checkbox and that setting is saved for future sessions. 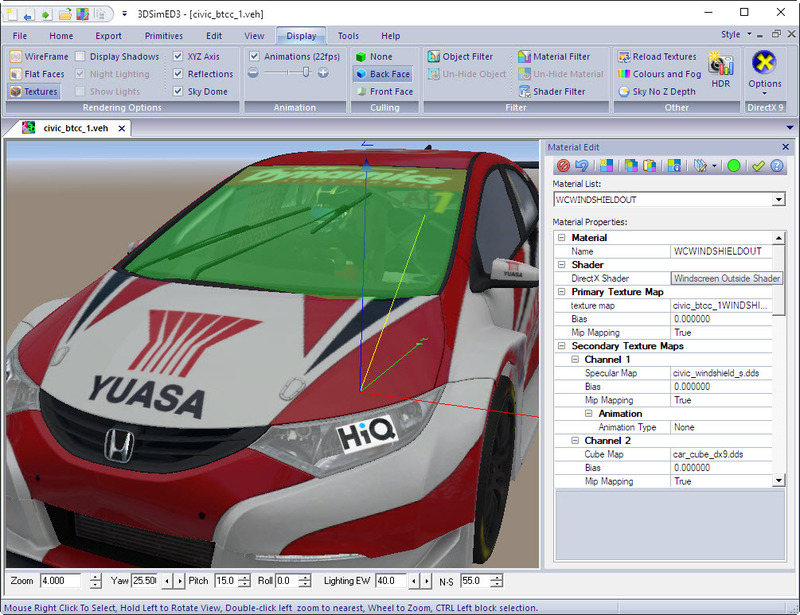 FXAA Post processing is included and the Sky Dome is correctly rendered. Fix: BC7 format DX10 .DDS texture maps were causing assertions due to a problem with the NVidia DDS library code. Fix: Export FBX Plugin was naming nodes and meshes incorrectly . Fix: Object Instance Edit->Replace Object with a .3SE could fail. (Existing .3SE should be corrected by opening and re-saving). Download version 3.1q at the download page. 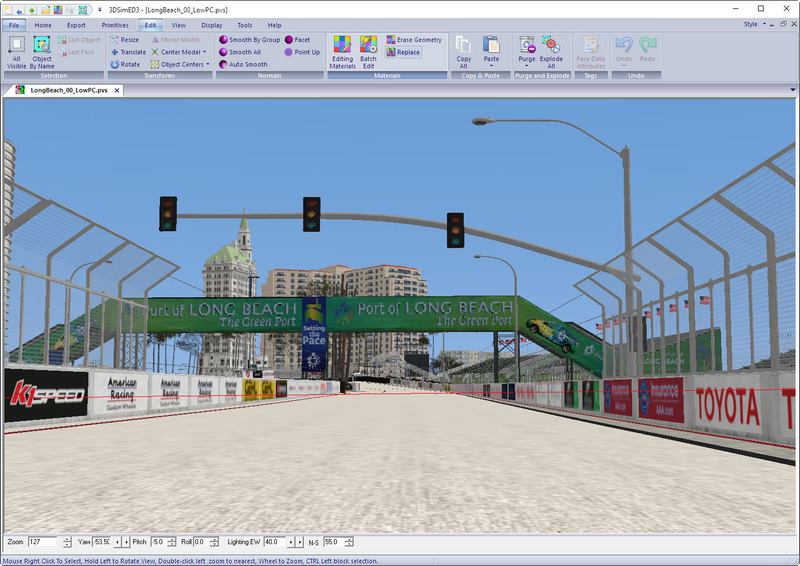 Fix: rF2 .GMT created using the latest 64-bit Max plugin will now import. Fix: The Material Edit -> Swap texture channel coordinates function could give incorrect results if both channels were not 0 (1->2,1->3,2->3). Fix: Exported Wavefront .OBJ are now smaller for models which have been edited. Fix: In some situations, FBX Export was including deleted geometry. Fix: Open 3SE could fail if saved 3SE contained objects. Enhancement Import Forza Apex/7 tracks, the “Replace missing texture map” option now replaces all missing texture maps with a ‘blank’ (grey) texture map. Fix: BC7 format DX10 .DDS texture maps loss of detail, this particularly caused problems when importing Forza 7 or Apex tracks.